Super quick to make and an easy twist on a favourite summer dessert, our delicious Layered Strawberry Shortcake is a dessert everyone is sure to enjoy. And since this "cake" is made with purchased ladyfingers, there's no baking required - leaving your kitchen nice and cool. Beat cream cheese in large bowl with whisk until creamy. Add dry pudding mix and milk; beat 2 min. Stir in Cool Whip until blended. 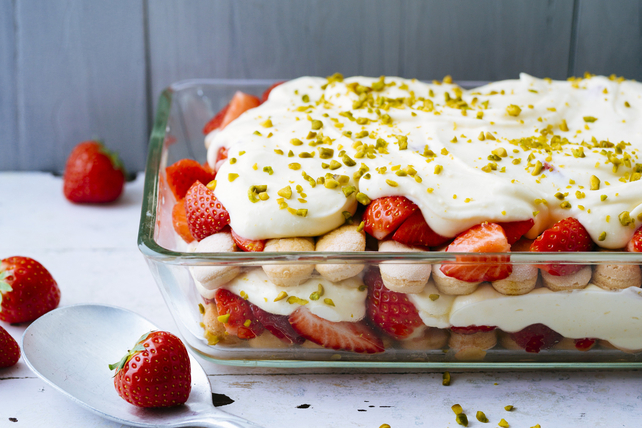 Place half the savoiardi in single layer on bottom of 13x9-inch dish; top with layers of half each of the strawberries and cream cheese mixture. Repeat all layers. Refrigerate 2 hours. Sprinkle with nuts before serving. When serving adults, drizzle this delicious dessert with brandied orange juice if desired. Just mix 1/4 cup orange juice with 1 Tbsp. brandy or rum. Drizzle over chilled dessert before sprinkling with the nuts.